This book offers a resource to aid in implementing psychosocial screening, assessment, and consequently integrating prevention, care and treatment (i.e. pharmacological, psychosocial rehabilitation and psychotherapeutic) in medicine. It is becoming increasingly recognized that one method of combating spiraling health care costs in developed nations is to integrate psychiatric care into medicine including primary care settings. 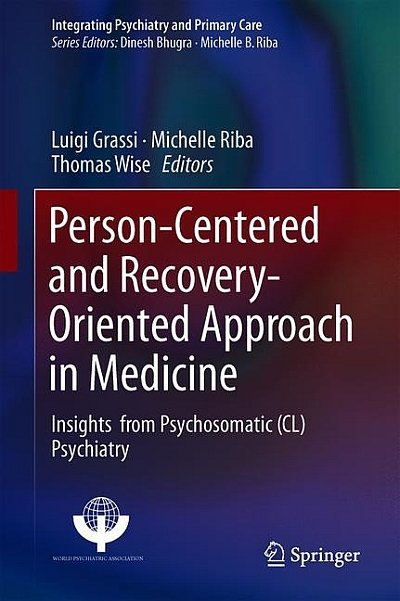 This volume reviews the main issues relative to the paradigm of a person-centered and recovery-oriented approach that should imbue all medical areas and specialties. It proposes integration methods in screening and assessment, clinimetric approach, dignity conserving care, cross-cultural and ethical aspects, treatment and training as a basic and mandatory need of a whole psychosomatic approach bridging the several specialties in medicine. As such, the book addresses a topic that all physicians, including primary care and psychiatric professionals in a wide variety of mental health settings are currently discussing, planning and preoccupied with, namely the task of integrating mental health into all the medical fields, including primary care, cardiology, psychiatry, oncology and so on. Luigi Grassi, M.D., M.A., is Professor and Chair of Psychiatry, Director of the University Hospital Psychiatry Unit and Dean of the Department of BioMedical and Specialty Surgical Sciences at the University of Ferrara, Ferrara, Italy. Dr. Grassi's clinical and research interests are in the area of consultation-liaison psychiatry and psychosomatic medicine, psycho-oncology, and psychosocial rehabilitation in psychiatry. He has been the President of the International Psycho-Oncology Society (IPOS) (2006-2008) and Chair of the Federation of Psycho-Oncology Societies (2008-2016). He is currently Chair of the World Psychiatric Association-WPA Section on Psycho-Oncology & Palliative Care, and co-Chair of the WPA Section on Psychiatry, Medicine and Primary Care, President of the Italian Society of Consultation-Liaison Psychiatry, and of the Italian Association of Cognitve-Analytic Therapy. Dr. Grassi is in the board of several international journals and author of about 150 scientific papers published in peer-reviewed journals, chapter of books and books related to psycho-oncology and psychiatric aspects of medical illness. He co-authored the book Delirium- Acute confusional states in palliative medicine(Oxford University Press, 2011, 2nd edition) and co-edited with Michelle Riba the booksClinical Psycho-Oncology: An International perspective(Wiley, 2012) andPsycho-pharmacology in oncology and palliative care(Springer, 2014). Michelle B. Riba, M.D., MS, DFAPA, FAPM, is clinical professor and Associate Director of the University of Michigan Comprehensive Depression Center, and Director of the PsychOncology Program at the University of Michigan Comprehensive Cancer Center. Dr. Riba is Past President of the American Psychiatric Association and Past Secretary, World Psychiatric Association Scientific Publications. Dr. Riba's clinical and research interests include primary care psychiatry, depression and cardiovascular disease, psychoncology, and the role of screening for distress in patients with medical illness. She has served on the editorial board of Psychiatric Services and Cancer News on the Net, Current Psychiatry, section editor of Current Psychiatry Reports, Deputy Editor of Psychiatric Times, and has served on the editorial advisory board of the American Psychiatric Press, Inc. She is a reviewer for Psycho-Oncology; Academic Psychiatry; Psychiatric Services; Journal of Psychiatric Practice; and Psychosomatic Medicine; Breast Cancer Research and Treatment. She has co-edited 15 editions of The American Psychiatric Press Review of Psychiatry series. She has co-edited Psychopharmacology and Psychotherapy: A Collaborative Approach; Primary Care Psychiatry; and The Doctor-Patient Relationship in Pharmacotherapy: Improving Treatment Effectiveness and has edited or co-written another 30 books. Thomas Wise, M.D., is Professor of Psychiatry at George Washington University and at the Virginia Commonwealth University as well as Professor of Psychiatry at Johns Hopkins School of Medicine. He has working in general medical settings as well as oncology units as a consulting psychiatrist. He edited Psychosomaticsfor two decades and is currently on the editorial board ofPsychosomatic Medicine. He has been president of the American Psychosomatic Society;The Academy of Psychosomatic Medicine;and the International College of Psychosomatic Medicine. He has published over 315 peer reviewed papers and textbook chapters. As recently co authoredPsychoOncologywith Massimo Biondi and Anna Costantini. His research interests have been coping styles in the medical ill and alexithymia.